Hi all! 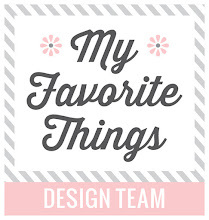 All My Favorite Things December Release is now available at MFT Store. So many amazing and fun new products, I have so much fun play with it! I stamp, color the images using copic then die cut it. The sentiment is from white embossing. Melania, I love the star shaped shaker element on your awesome card! I would love to make one for my granddaughter! Perfection! Lovely card. The ink blending is amazing! Fabulous coloring on this adorable scene! I love how you did the background on this one! So excited to buy the You're Super set - love your card! This card is so awesome!! Like your background for your sweet super heroine! So cute! Love the colors and stenciled rays behind her. Love the diecut city and how the girl is towering over it. I love this! 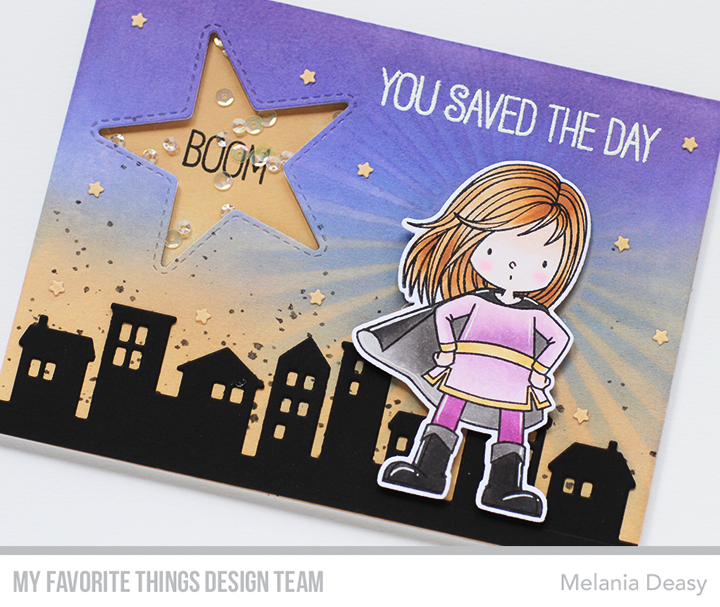 The way you have the radiating rays behind the superhero gives this such a fun look! I was thinking exactly the same as Natasha, love the rays behind her! Love the sunrays behind her!!! Boom! So nice background and color combo Gorgeous card! Awesome card!Love your coloring!Thank you for the inspiration! Fabulous card! I love all the details in this card, everything form the fun shaker element to how you colored the super hero. 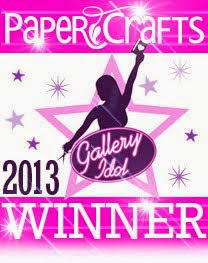 As Always thanks for more Craftabulous ways to use your Awesome Goodies!! The star shaker is a terrific compliment to the little superhero. Cute! Love the star shaker - this set is awesome! I'm in awe of this creative card! It's awesome deluxe! All your elements fit perfectly together to make a super cute card! She's a super hero beauty. I adore this set! Such a cute card. cute card! Love this shaker! Fabulous card! I love this set! Beautiful background and colouring on the little super hero. Thanks for sharing your creativity. Great scene and coloring. Love how you added the small shaker element. My granddaughter would go nuts over this card! I am going to see if I can do my own twist on your card and send it to her. This sweet heroin looks great in any colours, as your card so clearly shows. Fun scene--I like the star shaker. 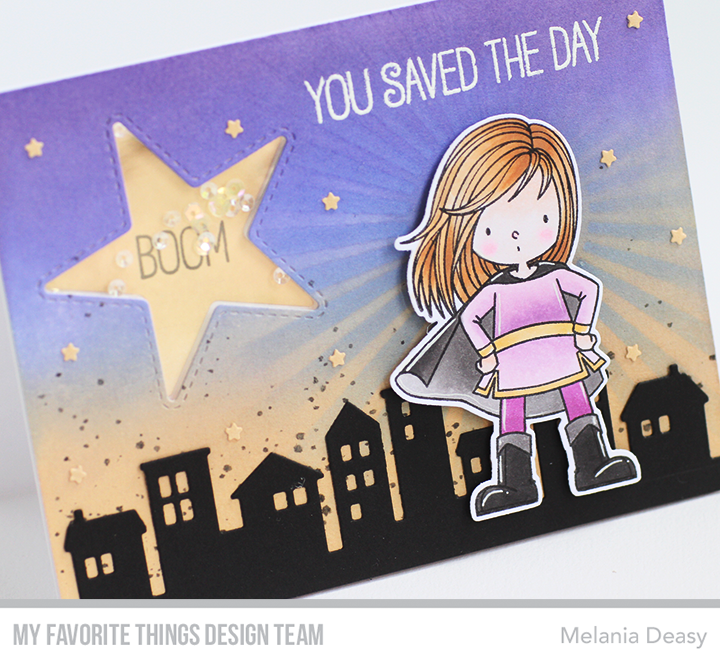 Amazing card...love the shaker star, purple colours and cute super hero! Love everything about this card. 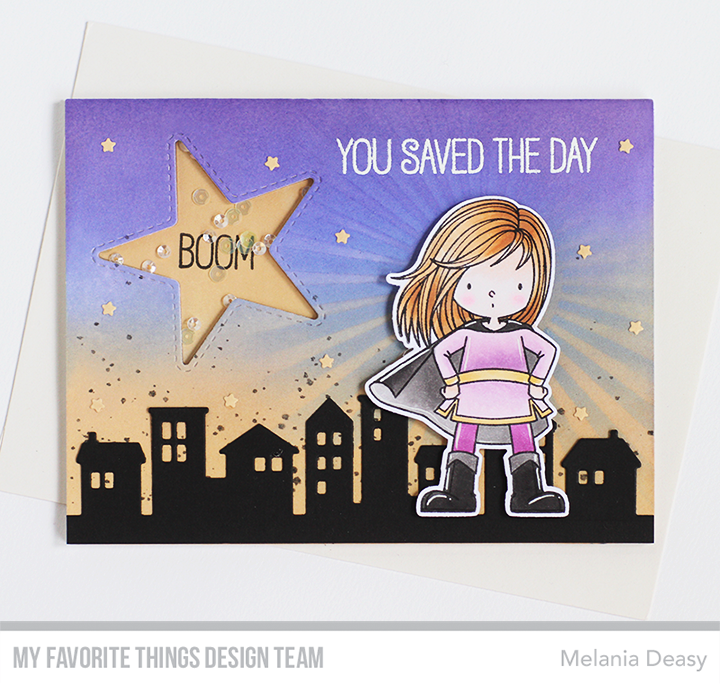 The "boom" sentiment within the star, the background behind the girl, all of it is just super cute!